I don’t know about you, but whenever it gets even kind of chilly, I start craving soup. This past nasty, scary, rainy weekend was no exception, so Sunday afternoon, I put this soup in the crockpot. 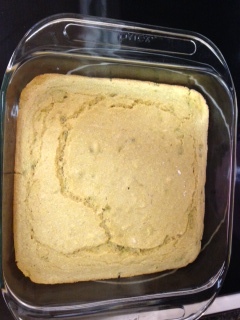 When J found out that’s what I was doing, he requested cornbread on the side. Since I’m a cornbread addict, too, I was happy to oblige. For years, I always just used the cornbread recipe on the back of the cornmeal box, but a couple of years ago, I decided to try to make it healthier. Eventually, I came up with this recipe, which tastes just like the original but is sugar- and oil-free. Mix all those things. Dump in a sprayed 9 x 9 pan. Bake at 400 degrees for 20 minutes. Eat like a boss. I put a can of green chilies in this batch. That’s why it has weird green spots. It’s not moldy. Also, I am bad at food photo-taking. Probably because I just want to eat it. What’s your favorite chilly-day food? Previous PostBack in the Groove: Target PracticeNext PostTarget Practice. Back on Sunday. I am not huge on soup, but I do start to crave more squash, not the zucchini kind. I have a butternut squash in the oven right now. 🙂 I love the fall squashes! i just start craving ALL THE FOOD when the weather gets cooler. i get super hungry for anything hot/ creamy/ thick/ gooey/ etc. this looks delicious, i love the added green chilies! Yum! This corn bread recipe looks so good! I will have to try it but maybe add a few jalapenos! My hubby would probably like the jalapeno version better. He loves all things spicy but I am a complete wuss.